If you have Croagunk in play, this attack does 20 damage plus 20 more damage and the Defending Pokémon is now Poisoned. It makes electricity with pouches in its cheeks and shoots charges from its tail. It live atop trees. The Pikachu was kind of decent. Sure, 30 isn’t much, but paired with Vileplume you had a fun paralysis lock deck. 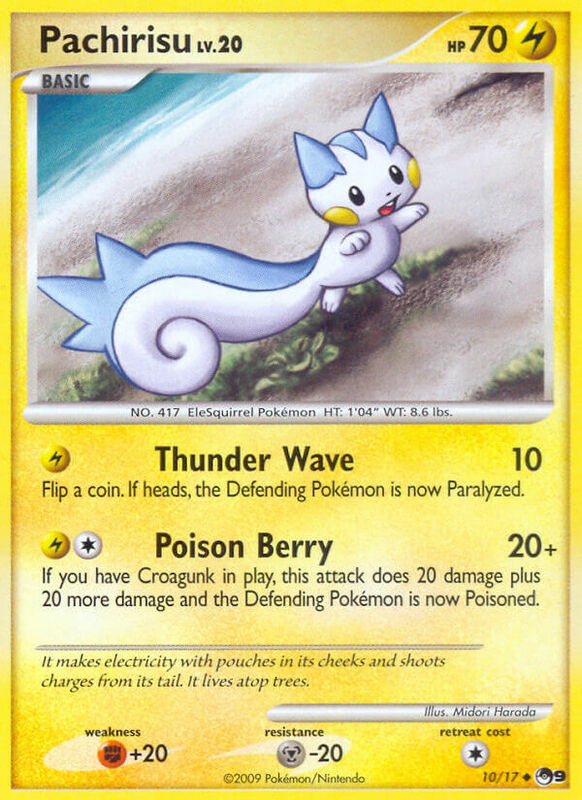 POP 9 was rotated before Vileplume was legal for tournaments. Poo. That would have been fun. MD-on always confused me which promo sets were legal. Is Poo the most obscene word the moderators will let you say? I’m sure I could get away with slightly worse. I just tend to watch my language on Pokemon sites. Kids tend to go there. Dude, 9 year olds should know most swear words anyway.